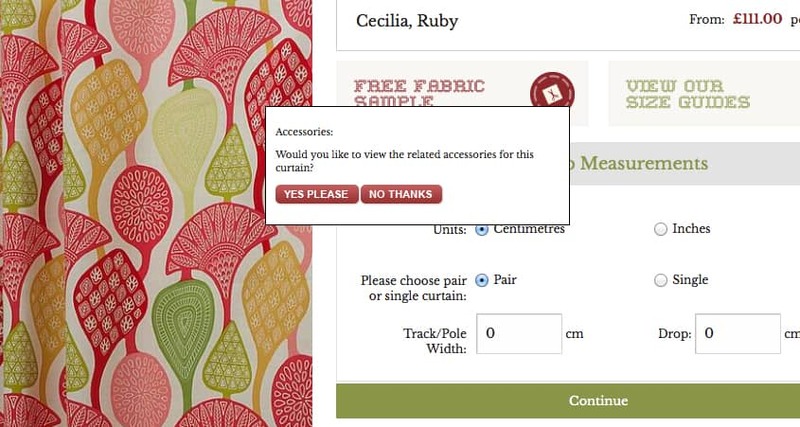 Welcome to our guide to ordering made to measure curtains. Let us take you step-by-step through the ordering process. 3. 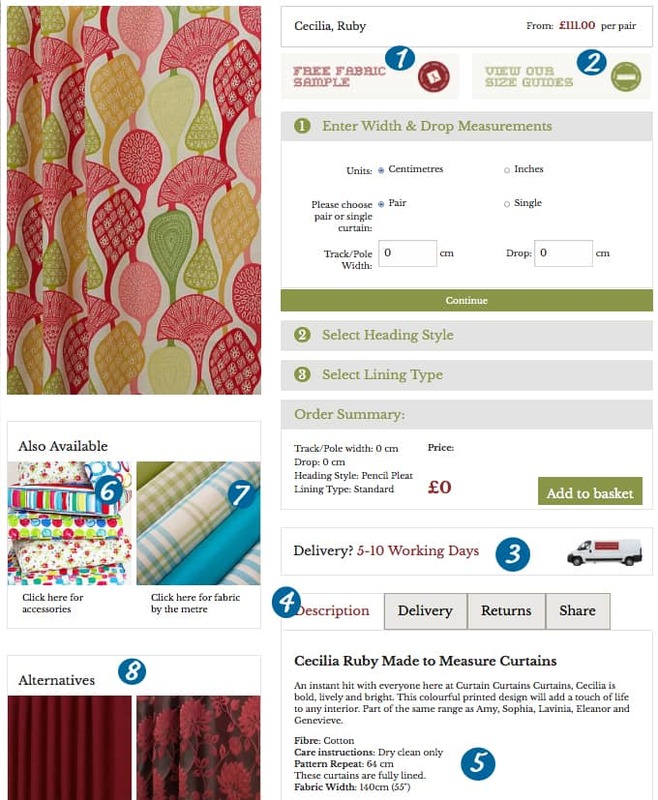 Or click on the Made to Measure box under the main banner. You will be taken to the Made to Measure Department. There are around 1,500 choices, which are displayed over 25 pages. You will probably want to narrow down your options, by clicking on the filters on the left hand side of the page. 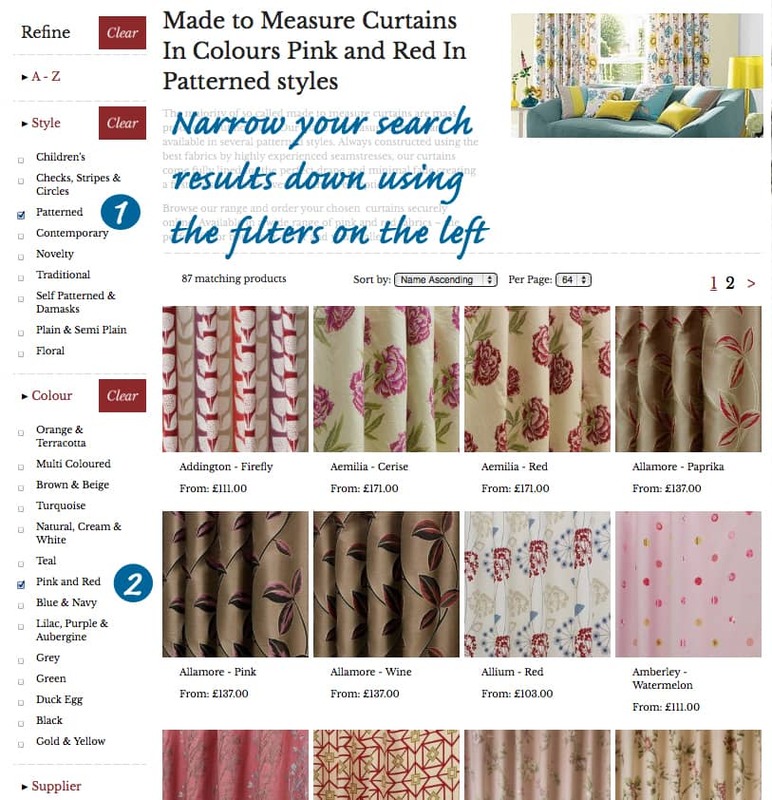 You can see from the image below that I have chosen to filter by style (1) and I've selected 'patterned' and as I am looking for red curtains I've also filtered by colour (2). You will be taken to the product page, which is filled with handy features, such as..
1. 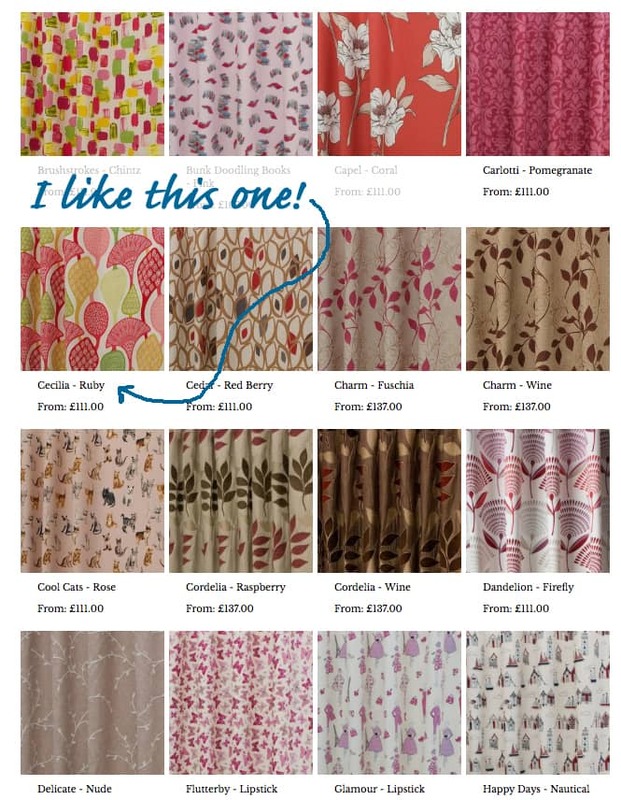 Click here for a free fabric sample. 2. Click here to view our measuring and size guides. 3. You can see the estimated delivery time frame here. 4. This tab box contains the fabric description, delivery details and returns info. Click on each tab to find out more. 5. You can see here the fabric composition, care instructions and other details. 6. 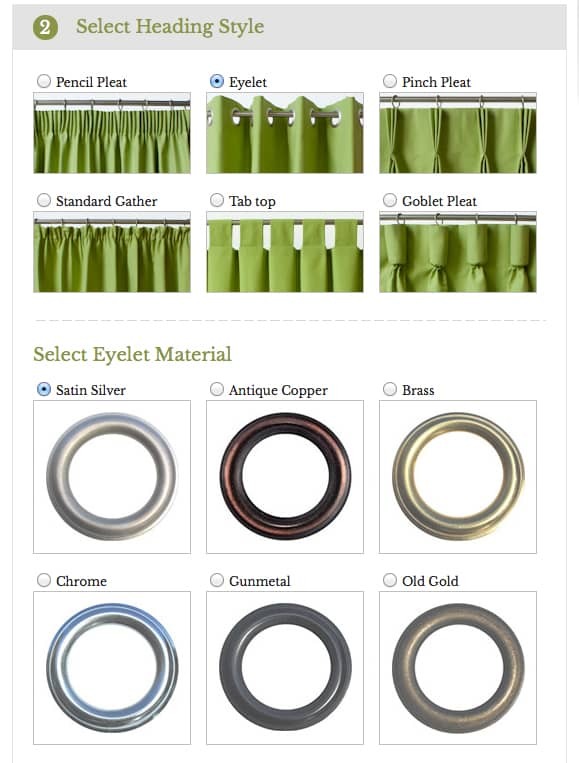 Click here to see matching accessories such as tiebacks and valances etc. 7. You can buy matching fabric by clicking this link. 8. Some alternative fabrics are recommended here, as you can see, sometimes it works better than others! 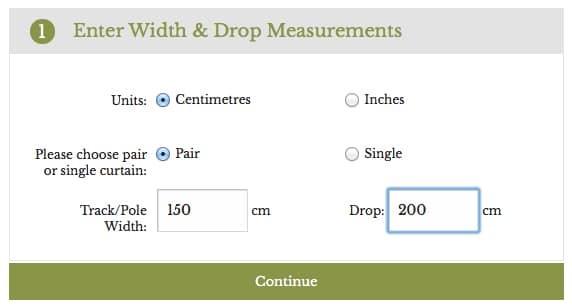 When you are ready to order your curtains, you can choose to enter your measurements in centimetres or inches. 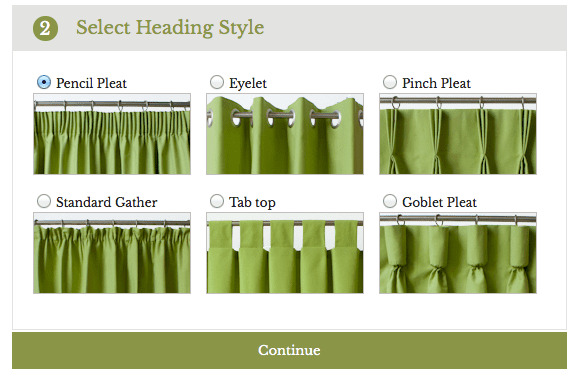 You can also choose whether you would like a pair of curtains or a single curtain. Then you can enter the width of your track or pole (not your window!) and the required drop of your curtains. Visit our measuring guide if you need help with your measurements. Click 'Continue' when you are ready for the next step. Once you've entered your measurements, you may wish to scroll down to the bottom of the page to see the price grid. The size of curtains you have ordered will be highlighted. This is useful if you would like to know roughly how wide each curtain will be. You can see here, that each of my curtains will be approximately 193 cm wide. The system will automatically calculate the nearest to double gather. For an explanation of 'gather' please click here: what is gather? 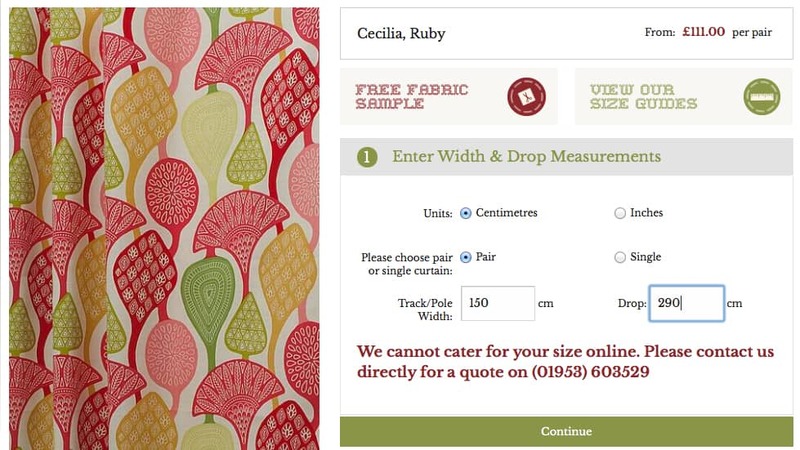 If your curtains are over a certain drop or width then you will get the following 'we cannot cater for your sizes online' message. We will still be able to make your curtains for you, but the system can only cope with measurements up to a certain point. Please call us on 01953 603529 to discuss your order and we will be very happy to help. 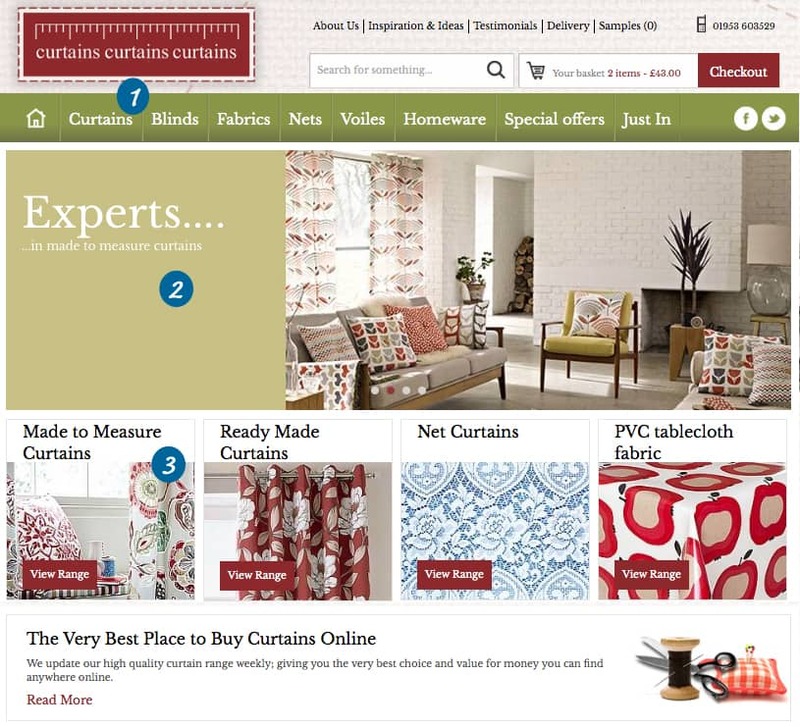 Alternatively you can email us at info@curtainscurtainscurtains with the fabric and sizes for a quote. Select the heading style you would like. You can find out more about each heading style by clicking here. Make sure the dot is highlighted in blue next to the heading you have chosen. Click 'Continue' when you are ready to carry on. If you choose an eyelet heading a new box will appear with the choices of eyelet colour. We recommend choosing your eyelet colour to match your pole. 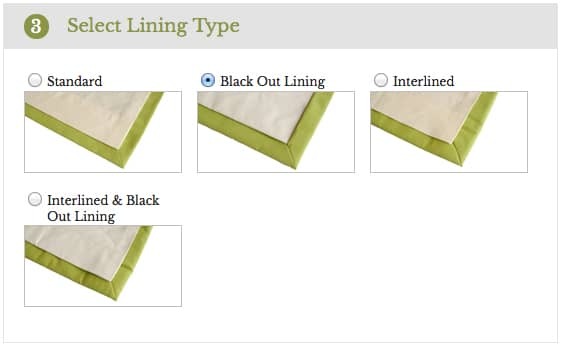 The next choice is lining, here is a link to an article about the qualities of each type if you are not sure which to choose: lining types. Just below the lining types you will see an order summary, comprising the sizes you have entered, the heading and lining type you've chosen and the price for the pair. Click the green 'add to basket' button once you've checked your details and are happy to proceed. A small box will pop up asking you if you would like to order any accessories (tiebacks, cushion covers and/or valances). Click 'yes please' to take a look, or 'no thanks' to carry on to your basket. Once you've added the curtains to your basket, the page will scroll to the top and show you the curtains going into the basket, as below. If you have finished shopping, you can click 'go to checkout'. Or if you'd like to carry on shopping you can close this box. When you're ready to complete your order just click on the basket in the top right hand corner of every page of the site. If you would like to see a similar guide to the checkout process, please click on this link: Step-by-Step Guide to Checkout.